Songs of strife are important sociological and historical documents. Most of them were written close to the event which they describe. Indeed, some contain information not to be found in the official records or newspapers of the time. Although many of these ballads, which were essentially journalistic by nature, were factually accurate, it is also important to remember that they reflected the feelings not only of the ballad-maker but of sizeable sections of the ordinary people. It was the character of these songs to reflect popular thinking and feeling. If the message was unpopular people would not want to buy the ballad and sing it. So the songs give us the collective emotions of the people on the actual events outlined in the street ballads. Consequently the role of the ballad maker in acting as a mirror of popular opinion could subvert his role as journalist and make him distort the facts of the situation in order, as we shall see later, to make his products attractive to his purchasers. In relation to this type of street literature, it should also be borne in mind that although one could be prosecuted for the singing of seditious songs from Elizabethan times, until the foundation of the Land League in 1879, ballad-singing was one of the few non-violent forms of protest available to the peasantry on questions affecting them. Making and singing such songs was also a way of indicating support from those who themselves would not resort to acts of violence. It is worth remembering too that poor, illiterate or semi-illiterate people were often great believers in the power of words – songs, writing and speeches – to change the world, and the agrarian revolution in 19th century Ireland wrought considerable social and economic changes for the tenant farmer class, if not for labourers. Part one of this article outlines the historical context of the murders which inspired the ballad-makers, while part two examines the songs themselves. Some of the songs are represented in full in the text with a commentary. The remainder are contained in Appendix I below. Songs tended to be written about the more dramatic cases, ones that captured and fired the public imagination and were the subjects of gossip, talk and controversy. Of the eleven songs examined here, four are from Kerry, three from Tipperary, and one each from Limerick, Clare, Galway and Donegal. Cases where miscarriages of justice had occurred were often the subjects of songs and five of our collection belong to this category. Again, five out of the eleven are execution songs. The Irish execution song is thought to derive from the English broadsheet of that type, and, like its English counterpart, caters for the human appetite for the gruesome and the macabre. Such Irish songs are often framed in the first person and entitled ‘A Lamentation’. There are two so-titled in our selection, ‘The Lamentation of James Walsh’ and ‘The Lamentation of the two Cormacks’. Execution songs like these nearly always contain an admonitory verse or verses, along with the verses or lines of repentance, affirmation in the church and its beliefs, and of hope in divine mercy. Historians have said that agricultural labourers were not very supportive of, or interested in, the Land League.6 This, however, does not seem to apply to its terrorist wing, the Moonlighters, specifically the Moonlighters of the Castleisland area, the acknowledged centre of the struggle. Evidence from here suggests that farm labourers were very involved in Moonlighting.7 Of the agrarian murders considered here most were carried out by labourers or small tenant farmers. The first of these concerns the shooting of the land agent, John Ellis, at Killahara near Loughmore, Co. Tipperary, as he returned from the railway station in Templemore on a dark October night in 1857. Two farm workers, William and Daniel Cormack, were put on trial, convicted and hanged for the murder in May 1858. They protested their innocence to the end and local lore has it that the murder was commited by an aggrieved tenant named William Gleeson, who subsequently emigrated to the United States and lived out his life in New York. The Cormacks were said to have murdered Ellis because he seduced their younger sister, Kitty. The assassination of Lord Leitrim in April of 1878 and the killing of his young secretary, John Makim, and the car driver, Charles Buchanan, on the Milford road close to Mulroy Bay, was the work of three men, Micheál Rua McElwee, a small holder and two tailors, Hugh Shiels and Michael Heraghty. They were members of a secret society, probably some kind of Ribbon society, in the Fanad peninsula. Heraghty was traced to the crime through the smashed stock of a gun found at the scene. He was charged and was awaiting trial when he died of typhoid fever in Lifford gaol. At the end of March 1882 Arthur Edward Herbert was shot dead on his way home from the petty sessions at Castleisland where he had presided that day. Herbert was a descendant of the planter, Sir William Herbert, who had received 13,000 acres in the Munster Plantation of the 1580s which followed the Desmond Rebellion. Two men, John Casey, whom he had sentenced to a month’s imprisonment that day on a drunk and disorderly charge and James Brown, who had served time for indecent assault, were subsequently at different times arrested and charged with the crime, but they were never tried as there was not sufficient evidence. It has, however, always been the belief in the Castleisland area that they were the killers. They may have been acting on their own or as agents, paid or otherwise, of the Moonlighters. Casey and Brown were casual farm labourers and from what we know of them not men of much character. The raid for arms on Castle Farm, the residence of John O’Connell-Curtin, was the work of a local band of Moonlighters. We know who some of these were because one of them, Timothy O’Sullivan, was shot dead and two others, Thady Casey and David Daly, were charged, tried and convicted. At least two of the three had worked at Castle Farm and the gang seems to have been composed of farm labourers and sons of small farmers who were often labourers too. As true as I hear people say. (Source: Department of Irish Folklore, UCD., main manuscript collection, vol. 54, pp 348-9. Collected in Cork, 1934). Where I knew each nook and corner. (Source: Department of Irish Folklore, UCD., main manuscript collection, vol. 407, p223. Collected in Limerick, 1937). We are told in this source that the author of this song was prosecuted and imprisoned and when released had the good sense to frame the next one in the form of a fox-chase. (TEXT: Broadside in P.J. McCall’s collection, N.L.I. missing lines, between square brackets, from a broadside probably printed in Liverpool; Linenhall Library, Belfast). He told me I should quit the place and show my face no more. From Dublin quay to Belfast town, along the raging sea. My figure, size and form, and my name without a doubt. But still there was no tidings of me or my retreat. Till they were hungry and cold at the approach of day. A fox to get away so clear as I did from the hounds. But still their search was all in vain, for I gave them leg bail. And every wagon, car and coach, that went along the road. Connemara being remote they thought to that place I might resort. When they were getting weary they resolved to try Mayo. From thence they went to Westport and searched it high and low. And the moon began to rise; I said I’d make for a foreign clime. I am in the land of liberty, so a fig to all my foes. (Source: Georges-Denis Zimmermann, Songs of Irish Rebellion, Allen Figgis, Dublin, 1967, pp257-258). Another song from the same time is the ‘Lamentation of James Walsh’, one of two killers of Francis Fitzgerald. Four men in all died arising from this affair, the murdered man, his two assassins who were hanged and Denis Dillane, the instigator and paymaster of the murder, who was also executed. A lamentation was composed for him and the whole thing was seen as a great tragedy in the area. What I like about the ‘Lamentation of James Walsh’ is its reflective and analytic aspects. It generalizes on the murder to consider the causes of agrarian crime and blames the laws governing land tenure and ownership which were so heavily on the side of the landlord that the tenant was forced to operate outside them. For James Walsh and for us all. He acted both loyal and true. One act is enough to disgrace my name. I often sat down and began to pause. Myself I gave up to the barrack guard. My cause some alteration in their humane laws. He sees the danger if he breaks the laws. That gave the sons of Erin equal laws. Your rents you really would disregard. And before that period the times might mend. Where the fruits of your labour are daily spent. There was something strange in this I can’t see. The Lord have mercy on the souls departed! You will act ever cautious when you think of me. (Source: Mainchín Seoighe, Tankardstown, Kilmallock, Co. Limerick. Another broadsheet ballad on the same theme may be found in James N. Healy (ed), ‘The Mercier Book of Irish Street Ballads, Vol. 1’. Cork 1967, pp 72-73). Some of the songs like the Ballad of Francis Hynes, the Poff and Barrett Ballad, and the Maamtrasna Murderers, were written close to the time of the events on which they are based. The song that I used in the RTE Radio programme on the Maamtrasna massacre was written soon after the execution of the three men, Pat Joyce, Pat Casey and Myles Joyce on 15th December, 1882. We know this because the official version of the case is what is given and the question of false witnesses and perjured evidence is not mentioned. The song on Francis Hynes has references that could only be intelligible to people of the time. Judge Lawson, who sentenced Hynes, is mentioned and there is a verse in praise of the Lord Mayor of Dublin, Charles Dawson M.P., for trying to have the sentence commuted. A song that is remarkable for its factual accuracy is ‘The Ballad of Arthur Herbert’. This contains a detailed description of his assassination which coincides with, and was probably taken from, the newspapers of the time. It also reflects local feeling on the killing, the lack of sympathy for Herbert and the perception of him as hard and cruel. Was known to very few. To call his soul away. Into his right palm tore. That in his pocket lay. As so the bloodstains tell. In Ireland he had been. While all the songs are songs of agrarian murder, four are also laments for men whom the ballad-maker believed were innocent and executed in the wrong. As I said previously, I do not agree with the song-writer in the case of Hynes. These songs contain deep expressions of sorrow and grief. Francis Hynes is referred to a number of times as a ‘martyr’. But what of the ballad-maker’s attitude to, and feeling for, the victim, or to broaden it out into a political question, where did he stand on the land question? The answer to this is the same in regard to all of the songs. The ballad without exception is on the side of the tenant farmer and supportive of his cause, hostile to the landlord and the civil authorities, on the side of the Moonlighter and the assassin and mostly unsympathetic to the victim. For instance, in the lament for Francis Hynes there is no word of sympathy for the poor herdsman shot dead coming from mass, or for his wife, or for the seven orphans that he left behind. He is gone and fills a martyr’s silent grave. He was sentenced by Judge Lawson for to die. And a martyr died young Hynes that is gone, that is gone. For to gain young Francis Hynes his reprieve. So a prayer for Francis Hynes that is gone, that is gone. Then a prayer for Francis Hynes that is gone. Of the martyr, Francis Hynes, that is gone that is gone. (Source: James N. Healy, ‘Mercier Book of Irish Street Ballads’, op. cit., pp 35,36. Another version by P. Hanley appears in Dal gCais No 7, p.125: Source: Department of Irish Folklore, UCD). *See Appendix I below. 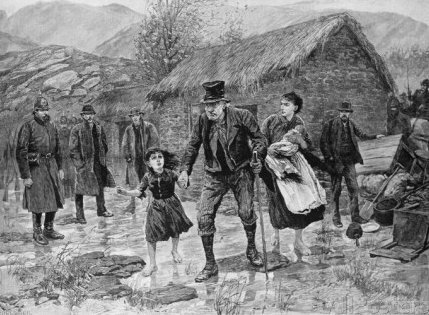 Scene at an Irish eviction in County Kerry, ‘Illustrated London News’, 15 January 1887. He then goes on to seemingly libel the family saying that one of their ancestors brought to the gallows “four dozen croppies” in the year of ’98. In 1798 some fighting did take place in the Castleisland area and some local men were executed for their part in the uprising, including a man called Tadhg Leathan Nolan. But the claim that an ancestor of O’Connell-Curtin’s betrayed them seems to be a fabrication. For O’Connell-Curtin was not a native of Co. Kerry at all. He came from a prosperous farming family in West Limerick where his father held three farms from the Earl of Devon. Educated by the Jesuits at Clongowes Wood College, he had come to Castle Farm about forty years earlier when he had married Agnes de Courcy who was related to the Sandes family of north Kerry. In fact, O’Connell-Curtin’s background was a nationalist one. Lore had it that the family had sheltered Michael Doheny after the abortive rising in 1848 when he was being sought by the police.22 And O’Connell-Curtin was a joint treasurer of the Firies branch of the Land League when he was killed. He was seen locally as a generous, kindly neighbour who had built four stone-walled, slate-roofed houses for his permanent farm workers at a time when not many of them enjoyed such a standard of housing. The leader of the band of night-walkers was Thady Casey, who was a regular visitor to Castle Farm and whose father had been a recipient of the family’s generosity. Yet when Fr. Murphy, the curate of Firies, spoke at Sunday mass of the dead man’s charity, sincerity and devoutness, most of the congregation left the chapel. The surviving members of the family had to have police protection and they were boycotted, jeered and booed when they went to mass. The family pew was dragged from the church and smashed and smeared with excrement. Two men, Thady Casey and David Daly, were subsequently sentenced to penal servitude for their part in the affair.23 They are described in the song as “those two innocent men.” In 1887 the Curtins were forced to sell their fine farm and leave the area. The song is a good example of how the facts of a situation can be distorted and turned on their heads to put a particular slant on an incident. TEXT: Broadside ballad reproduced in ‘The Times’, 10th February, 1886. Which murdered the poor widow’s darling. It was heaven decreed it that Curtin should fall. God prosper him over the water. That the Lord he may keep them from harm. What is one to say by way of some concluding comments on the sources of this agrarian violence? The struggle for the control of the land of Ireland is steeped in violence. The confiscation and plantations of the sixteenth and seventeenth centuries, which gave the land to supporters of the English Crown, were carried out by fire and sword. The ordinary Irish countryman and woman of the nineteenth century was the government of Ireland, its laws and its agents, as hostile and alien to them and supportive of, and sympathetic to, the landlord and his representatives; or, as Wolfe Tone put it ‘a government of force’. Each of the stories in our study presents us with a cameo of our agrarian history. The greed for land and the determination not to be put off it constitutes one of the principal motors of Irish history. O you boys of the shamrock, pay attention to my ditty. Be alive to your duty, be wise and be witty. And we’ll give them what Lord Leitrim got below in Donegal. He left bailiffs, bums and harlots in the castle of Lough Rynn. Saying: ‘We’ll hurl out the Papish and we’ll drown them in the sea. ‘Of Rory or the devil, sure, I never was afraid!”. All to protect the widows in the County Donegal. When young Rory seen him coming, his heart did jump for glee. He gave three cheers for Tenant Right, Home Rule and liberty. Oh, this monster’s face began to foam. And roared out in a hellish tone: ‘Sir, Tell me who are you? At his old brain they took fair aim and they hurled him in the mire. To revenge the joke, his head they broke, and his carcass there did maul. They stuck him in a pool, his head to cool, below in Donegal. Where the men they jumped into a boat that there at anchor lay. And the devils all, both great and small, they had a sumptuous feast. And the devils ate him, rump and stump, that night in Donegal. *Other versions have: ‘who never feared a ball’. A mournful execution that happened in Tralee. Or owed him any grudge. Who’s Mother, maid and wife. And grant to them relief. His dying words as well. To know who first would die. Those words addressed to all. Or woman on this earth. On the ninth of February ninety-five upon the scaffold high. But paid spies and informers, my life they swore away. For the murder of James Donovan we arrest you on this day. On the ninth of February, ninety-five, will be your dying day. The jury found me guilty without the least delay. May the Lord forgive my enemies who proved my overthrow. May the Lord forgive my enemies, on all their judgement day. And of Dwyer their leader. (Source: ‘The Patriotic Songs and Poems of J.J. Finnan (“Myles”)’, printed and published by Guy & Co., 114 O’Connell Street, Limerick, 1913). In front of Nenagh Prison – their friends may now deplore. They [thought] it little scruple to swear our lives away. As they were dying innocent upon that dismal hour. In union with the sacrifice of Christ on Cavalry. And here, as well as Nenagh, many trembled at the same. O God, have mercy on their souls! For dreadful was their doom! And launched into eternity before the Lord on high. I call on all that’s standing by to join in prayer with me. May the Lord have mercy on their souls, good Christians, for them pray. For the Maamtrasna murders they were condemned to die. And may we again such a tragedy in Ireland never see. The clergy have attended them with unremitting care. Their sentence was a fearful one in manhood’s prime to die. Whether day or night they’ll have no peace, these visions will arise. The verdict no one could dispute, the evidence was plain. And to the five respited men give each a tranquil mind. And still repeat that holy prayer, God save old Ireland. 1. For background on the land agitation see, for example, the following references: Paul Bew, ‘Land and the National Question in Ireland’, 1858-82, Gill & Macmillan, Dublin, 1978; Samuel Clark, ‘Social Origins or the Irish Land War’, Princeton University Press, 1979; T.W. Moody, ‘Davitt and Irish Revolution’, 1846-82, Oxford University press, 1981; F.S. Lyons, ‘Ireland Since the Famine’, Fontana, London, 1973. 2. Laurence M. Geary, ‘Parnell and the Irish Land Question’ in Parnell; ‘The Politics of Power’, Donal McCartney (ed), Wolfhound Press, Dublin, 1991. 3. Georgina O’Brien (ed), ‘Reminiscences of the Right Hon. Lord O’Brien’, London, 1916; Kerry Independent, 18 December, 1882. 4. ‘Freeman’s Journal’, 23 December, 1882. 5. Samuel Clark, James Donnelly Jnr., ‘Irish Peasant Violence and Political Unrest’, Manchester, 1983, pp. 278, 329, 330. 6. The Twiss brothers, John and George, were labouring men and active Moonlighters. 7. Interview with Michael Maher, Lough, Thurles, Co. Tipperary, 9 August, 1990. 9. ‘Cork Examiner’, 19 May, 1862. 10. ‘Limerick Chronicle’, 11 March, 1863. 11. ‘Limerick Chronicle’, 17 July, 1862. 12. ‘Cork Examiner’, 7 August, 1862. 13. Interview with Paddy Lalor, Tipperary, Co. Tipperary, 10 August, 1990. 15. John Twiss was convicted a number of times for poaching offences. He and George terrorized people because of their reputation as gunmen. John is reputed to have gone to the house of Robert Meredith, a substantial landowner in the Castleisland area, where his appearance in the doorway was sufficient to terrify the landlord. 16. Jarlath Waldron, ‘Maamtrasna: The Murders and the Mystery’, Edmund Burke, Dublin 1992. 17. ‘Kerry Weekly Reporter’, 12 January, 1895. 18. Interview with Michael Culloty, Currow, Killarney, Co. Kerry, October 1990. 19. ‘Cork Examiner’, 7 August 1862 and 22 September 1862. 22. Interview with John Cussen, Newcastle West, Co. Limerick, November 1990. 23. ‘Kerry Sentinel’, 18 December, 1885. This article was first published in ‘The Old Limerick Journal’ Summer Edition 2001, pp. 38-46.